Episode 21 is here, and what a tremendous episode it was. Matt and Storm's all-time favorite guest (sorry, Kurt), Katie Pavlich, is back in the studio to discuss today's news. To get the show started, they discuss the illegal immigrant invaders that are making their way through Central America in an attempt to cross the southern border. President Trump isn't tolerating it, and in a series of tweets, told the governments of Guatemala, El Salvador, and Honduras to get their acts together and stop this horde or they will no longer receive U.S. aid. The president also promised to deport anyone entering the country illegally and stated that he is willing to send the military to the border if necessary. Matt and Storm say bring on the tanks! In other news, the leftists are once again executing their mob tactics. This time, a low-life Antifa member is caught on camera verbally assaulting a 9/11 widow for apparently not crossing the street when he wanted. However, the lowlife isn't so tough, as a few large men came to the woman's defense. He ran away like a little schoolboy b****. Twitchy has the story here. 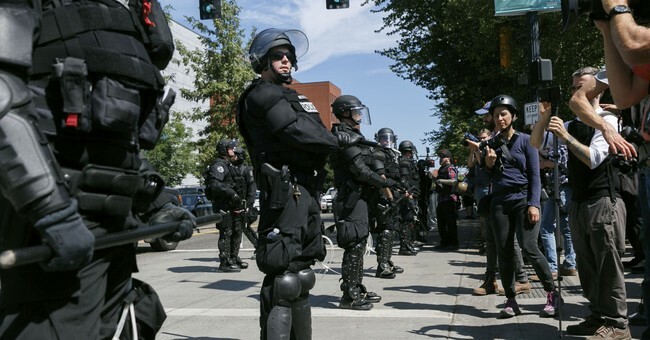 Antifa taking over Portland, Ore. isn't the only story of left-wing harassment and violence. In Nevada, the GOP campaign manager for gubernatorial nominee Adam Laxalt was violently grabbed and shaken by a 50-year-old Democratic operative, and two state house candidates in Minnesota were attacked as one was cold-cocked while at an eatery and another was chased after confronting a man destroying GOP yard signs. The three also discuss the brutal murder of Jamal Khashoggi, as there are several unanswered questions concerning his death and current sources can't be trusted. Oh...there's also a great smorgasbord segment and some key midterm election analysis. Don't miss out!